Fresh from their victories in the just concluded state Assembly election, the Gorkha Janmukti Morcha and the hill Trinamool Congress has embarked on a war of words over the issue of granting Scheduled Tribe status to the 11 communities of the hills. The hill TMC organised a victory celebration and a public meeting in Darjeeling where its leaders accused the GJM of hoodwinking the people over the issue by claiming Prime Minister Narendra Modi had endorsed its demand. Sardha Subba, the Darjeeling TMC candidate for the Assembly election and the hill Trinamool Mahila Congress president, said that according to a Press Information Bureau report released on Thursday, the Union Cabinet chaired by Modi on May 25 approved of the introduction of two Bills relating to the issue of granting tribal status to various communities in five states. According to the PBI report, the Cabinet has given ex-post facto approval to the amendments in the Constitution (Scheduled Tribes) Order of 1950 to modify the list of Scheduled Tribes in the state of Assam, Chhattisgarh, Jharkhand, Tamil Nadu and Tripura and the Union Territory of Puducherry. “The GJM claims the matter has been taken up by the PM himself and it is in the implementation stages. But the PBI report clearly shows that even though five states and a Union territory are mentioned, the demand from Darjeeling has been left out. This shows the GJM is playing with the sentiments of the people and fooling them for political interests,” said Subba today in the public meeting. The Prime Minister, campaigning in May for north Bengal BJP candidates in Siliguri, said the process of granting tribal status to the 11 communities had already been initiated and that a committee already been formed to look into the matter. The GJM wants the 11 communities to be brought under the ST list. The communities from the hills are Bhujel, Gurung, Mangar, Newar, Jogi, Khas, Rai, Sunwar, Thami and Yakha Dewan, and the Dhimal from the Dooars. Meanwhile, the GJM disagreed saying the Union Cabinet’s approval to place two Bills for the five states as reported by the PBI and its demand were in different stages. “She (Subba) is not aware of this. Committees were formed in 2013 for the five states and the UT, and based on the recommendations of those states, relevant Bills have been placed before the Cabinet. However, in our case, a committee was formed only this year, hence it did not find mention,” countered Binay Tamang, the GJM assistant secretary. All the same, he expressed happiness that the Cabinet had approved the introduction of two Bills for amendment, saying this would set a precedent. “When the Bills get amended, they will become the basis to facilitate the Centre to take up our case,” Tamang said. 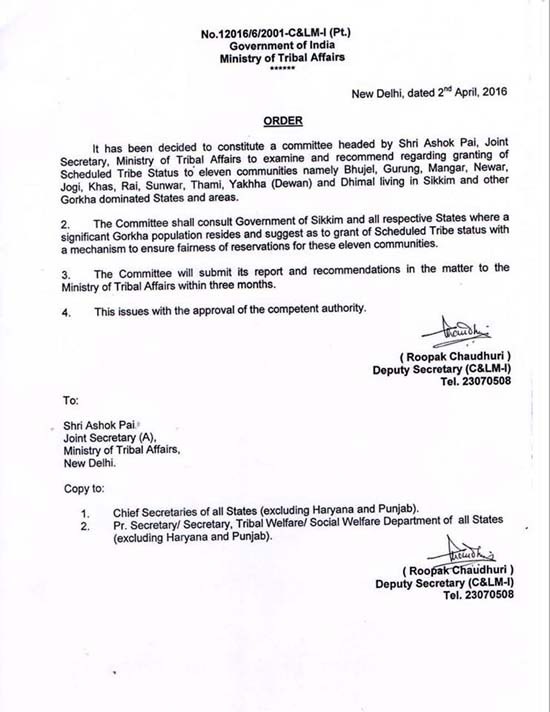 The GJM leader furnished an order issued on April 2 by deputy secretary of the Union tribal ministry Roopak Chaudhuri to the chief secretaries of all states, excluding Haryana and Punjab. 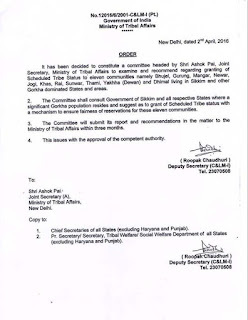 The order states the tribal ministry has decided to constitute a committee headed by Ashok Pai, joint secretary, Union ministry of tribal affairs, to examine and recommend granting of ST status to 11 communities living in Sikkim and other Gorkha dominated states and areas.